Whether you are a manager, agent, represented artist, self-managed artist, affiliated business vendor, or presenter, NAPAMA is here for you. We know this is a tough business, and we can put you in touch with the people and resources that can make things a little easier. Here are the resources that NAPAMA provides in service of the field. For information about our resources only be available to current members, click here. Performing Arts Connect (PAC) is a platform to inspire and cultivate potential arts professionals - providing a means to discover careers in the arts and engage with professionals in the field. Performing Arts Connect is also committed to reaching communities of diverse backgrounds, thereby promoting diversity of the field over time through education and inspiration. PAC is a panel of three professionals: self-represented artist, booking agent, and presenter (venue programer). Together, the three share their experiences and demonstrate their interactive roles to allow students to better understand the performing arts industry. Learn more about Performing Arts Connect here. With so many conferences, it can be hard to keep track of them all. 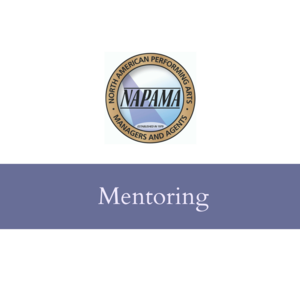 Through our liaisons and partnerships with arts and service organizations across the US and Canada, NAPAMA provided compiled information on performing arts conferences. Information on the conferences can be found here. Updates on deadlines are shared via our facebook page. All successful business require strong legal basis and understanding. Goldstein & Guilliams PLC has prepared several resources for NAPAMA on contracts as well as state-by-state license requirements for booking agents and artist managers here. NAPAMA partnered with the Alliance of Performing Arts Conferences (APAC) and Arts Northwest to create a 3-part webinar series on email marketing. Topics covered include: structured storytelling, effective email pitches, and email technology. Over the years, NAPAMA has created (and updated) the following guidelines to establish industry standards in the performing arts. Click each icon to read the guidelines. The NAPAMA 2016-2017 Study of the Touring Performing Arts is a market research project initiated by the volunteer NAPAMA Board of Directors. One of the key tenants of NAPAMA’s vision is to build and share knowledge, and through this research effort, NAPAMA is seeking to share information with the field. Information about trends in the field and touring artistic work specifically can help artists, agent/managers, and presenters with their short and long range planning, understand competition and benchmarks within their niche of the industry, and consider the value of investments like showcasing and conferencing. The results of the 2016-2017 Study are available through the Study Report for free to NAPAMA members and a nominal charge for non-members. Learn more about the survey and get your copy of the report here. Many US States have their own state-mandated withholding (ranging from 2% to 9%) that is applicable to gross payments to performers or performing entities. As agents, managers, and artists it is important to be aware of these rates as well as the waiver process as they impact budgeting, revenue, and more. NAPAMA has compiled information on State Tax Withholding, to the best of our knowledge, to assist in the process of navigating state tax withholding. Review the tax table here.